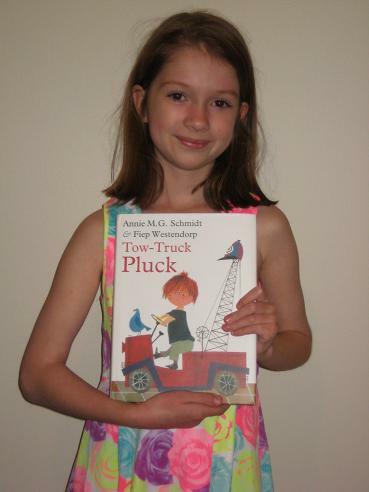 The book is called Tow-Truck Pluck and it’s by Annie M.G. Schmidt & Fiep Westendorp (and it’s translated by David Colmer). I liked it a lot 🙂 The pictures were also very good, and they were either very funny or quite surprising. I liked the book because all of the friends Pluck makes are very different, but he still finds a way for them all to get along together. For example, who would have thought that a seagull with a wooden leg would make friends with a girl whose mum doesn’t even let her take a step out of her apartment?! My favourite part was when Pluck sent Aggie, who was sick with the measles, liquorice and ice-cream and lots more lovely things – every day!!! No, not really. Although it was long, there were pretty awesome pictures to make it interesting. When I first heard about this book, I was rather excited as Annie M.G. Schmidt’s The Cat Who Came in off the Roof is arguably Emily’s favourite of all the books she’s reviewed so far. However, when I found out more about it, I was a little unsure, with the book seemingly pitched at a younger audience (in fact, I suspected it might be more suitable for my younger daughter), with illustrator Fiep Westendorp’s name prominent on the cover. Fortunately, though, Emily fell in love with the book immediately. This was probably partly because it’s a beautiful object in its own right, a large hardcover book with colour pictures on every second page or so, but my little helper was also taken with the story, an offbeat tale of a helpful boy and his rather unusual friends. ‘Thanks,’ said Pluck, and he hopped into his tow truck and drove to the Pill Building. Luckily for Pluck, no one has beaten him to the room, and within a few pages, he’s made himself at home, settling nicely into the neighbourhood, and picking up a talking cockroach as a roommate for good measure (it’s a long story…). This is just the start of his adventures, told in a charming manner in a story divided into around forty short chapters, cunningly designed to be perfect for bedtime stories for younger children. It’s a funny, slightly disjointed narrative, reminding me in its acceptance of the illogical of another of Emily’s recent reads, María Elena Walsh’s An Elephantasy – which is probably why it went down so well! With an entertaining story, the ever-present Westendorp illustrations and David Colmer’s excellent translation, this is another book that will take pride of place in my assistant’s bookcase. Little helper, thank for your review. After a short look I found a German translation for this book. Good for me, when it comes to Christmas I’ll have no ideas. Dorte – Very glad we could help (my little helper’s always thrilled when people enjoy her reviews! ).